Something needed to change. But how and what? How reading a book changed my view on our overwhelming workload. What has changed on the farm since I read this book? At the beginning we thought we would be able to finish our homestead in two years and then have it up and running. Making money with renting out a holiday tent and selling fruit and giving meditation lessons. What we didn’t expect is the amount of time it takes to do everything yourself. Apart from building our homestead we wanted to be as self-sustainable as possible. We do have electricity from the grid, but that is it. We had to provide our own drinking water and we use our own wood from the land for heating the house. We grow our own fruit and veggies, we have chickens for eggs and goats for milk, yoghurt and cheese. To keep the basics going is already a lot of work. Working very hard we managed to get the basics going. However, after 8 years there are still a lot of unfinished projects. When, in 2018 a violent wild fire destroyed half of our fruit trees we were almost ready to quit. We had to start planting all over again. It was so frustrating because we couldn’t handle the overwhelming amount of work no more. Over the years we tried a lot to handle our workload. Time management, dividing the work, schedules, working plans and much more. Some things helped, but the feeling that it was all too much remained. One morning when I woke up I was thinking about my grandmother. She used to have a homestead in the mountains in Indonesia, on Java. My grandmother lived in the mountains with her family, my grandfather was a specialist in treating tea plants. They lived in the middle of nowhere, more or less like we do. How did she manage? And how did all those pioneers who lived like my grandmother managed homesteading? I started looking for answers on the internet and came across a very special book, which changed my way of looking at the problem. After reading Trails of the Earth: The True Story of a Pioneering Woman by Mary Mann Hamilton, I realised that it is just what it is. 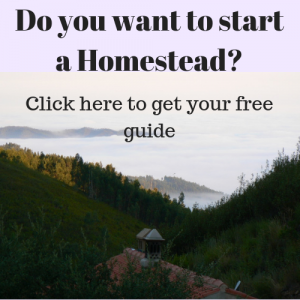 Homesteading is a lot of work, there is no way to avoid it. Reading this book helped me to accept a fact of life. In her book she describes her life in way that made me realise that there is no reason to be frustrated about the amount of work we have. She is not frustrated about having an overwhelming workload all the time, she takes it as it is. Unlike we did. I realised, since there is no way to change the never ending amount of work on a homestead, you might as well find a way to deal with it as it is. Mary Mann, my grandmother, they just lived with it. Since I have read the book our plans on the farm are much less ambitious. We stick to what we have and try to keep it as simple as possible. Enjoying what we have instead of missing what we do not have. This is a big switch of mindset. Since it is just a fact of life that homesteading is hard work, it is not changeable. What is changeable is the way you experience it. Working from the perspective that you like what you have means also that you lose less time by trying to gain what you don’t have. It is so much more relaxed. It also means that there is no point in hurry up things. There is going to be an endless amount of jobs and projects. When you finish one, there will be another one. You might as well take a nice break between the jobs. Enjoy a lazy Sunday or go party at the neighbours. Mary Mann Hamilton made us see homesteading in a different way, just by being herself and telling us her story. Thanks to Mary’s book Trail of the Earth, I am far less frustrated by an overwhelming workload. We now do one thing at the time. Instead of trying to finish homesteading, we actually are learning how to enjoy it. And believe me there is so much joy in it. Read the book and find out yourself how much it can do for you. Click here to get to: Trail of the Earth by Mary Mann Hamilton.